You pretty much explained what happened in the first session of this years Oni School as well. This was my second Oni School and I learned even more, just like you. Beside all that you stated, I learned how essential it is to learn and perfect the very "basic" cast. Learning to get the timing and accuracy correct will advance your fishing skills. If you don't, you will still catch fish, but not as many! The downstream cast was something new to me also, but it proved very effective and I caught ALL of my fish on a downstream cast and a little pulsing at the end and varying the depth by raising or lowering the rod. I lost a few fish when they broke off straight downstream and I couldn't get the fish to move left or right. The best thing about the School is the help you get. Rob Worthing was nearby and I asked him what to do in that case. He said "PRAY"! Oni gives so many great tips and examples it can be, at times, overwhelming. However, I followed some of his tips and was surprised when he came up after me and cast and drifted the fly in the exact same place I had been casting - neither one of us caught a fish, however. Watch, listen, try and learn, that's Oni's way. Watching Oni cast that 8 meter, #4 line in wind with pinpoint accuracy was amazing and we found later, it's not that hard to cast that same line! Go to the School and learn for yourself, it's worth every penny and you will meet new friends that you may fish with often in the future. The Elk will be safe next year! I'm convinced! Oni School is right in the middle of when I usually hunt elk. I harvested a nice elk this year. 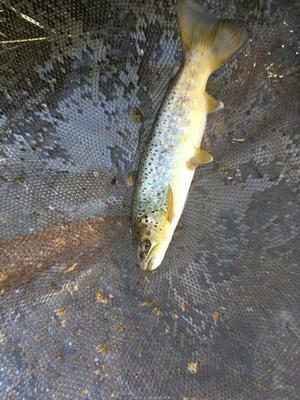 I have a lot to learn when it comes to Tenkara fishing. I don't fish a line much longer than my rods. It would be nice to be comfortable learning how to fish a longer line! Learning to read the water is a lifetime of lessons. If at all possible, I am going to Oni School next year. Les, the Oni school next year is in early August. You can cast and blast both - or use both feathered needles and feathered shafts if your prefer.